Home »Photography»Hell Froze Over – I’m Using Lightroom 3! No Apocalypse, but Hell must be frozen anyway. 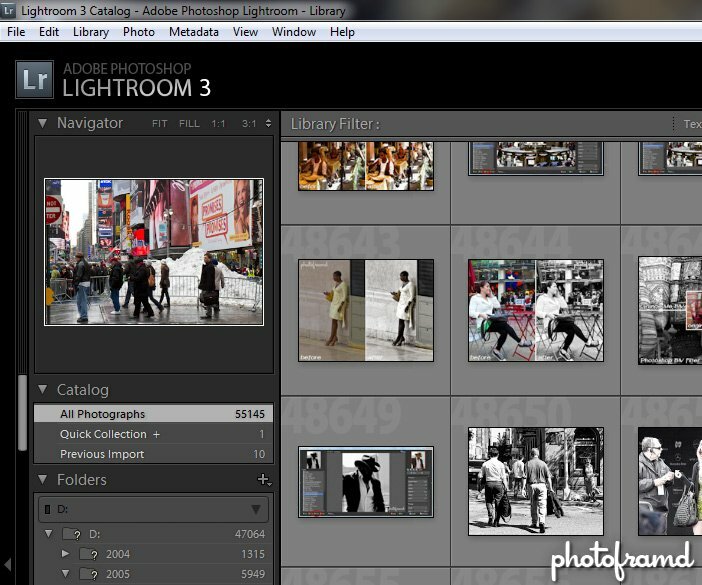 I am now a Lightroom 3 user! 1. There is no reason to have both Lightroom and Bridge. Adobe should merge these two programs once and for all. Even after years of maintaining both programs, Adobe has intentionally excluded certain features that are in one from the other. For example, Bridge can’t create catalogs and can’t even print a simple photo. You can’t even print the Meta data as a reference for a shoot! But, Bridge can handle Flash files which Lightroom can not. 2. Lightroom has never been included in the Adobe Suites nor Master Collection! WHY??? After spending all that money to upgrade to the Adobe Creative Suite Master Collection 5, which includes every major Adobe title, it did NOT include Lightroom 3. Adobe forced Flash into every Suite and increased the overall price, but can’t throw in Lightroom? WHY?? And, now they want to add “.5” updates to double your upgrade cost! 2. My Raid Drive failed again after deleting a massive amount of data. Raid just does not like it when you delete 500 GBs of files. 3. I found out that Lightroom can catalog DVDs and Blu-ray Discs. Instead of rebuilding my Raid for a third time, I decided that I would just stick with my DVD and Blu-ray Archive disks. If you do not own a Blu-ray burner yet, you should. The prices have come down for the drive itself. (I use the LG GGW-H20L Super Multi Blue Internal SATA Drive.) And, the dual sided BD-R DL disks can hold 50 GBs of data! The blank disks are still expensive, but B&H does have a great price on 3-packs and 10-packs. Just make sure that they are the 6x BD-R DL blanks otherwise it will take forever to burn and verify! funny you post this. I recently have also given it a spin and so far….I love it. great blog btw I’ve been lurking for a few months. great stuff. I still like Bridge and think it is quicker that to Photoshop. But, Lightroom is great for building a large collection for finding your photos. Have you formed an opinion on using DNG v. CR2 files in Lightroom? You realize that Canon is the leader in DSLRs with an estimated market share of over 45%. If a graphic program is going to support a DSLR format, it will be the CR2 format. CR2 is a very stable format that is not going anywhere. DNG was created by Adobe and has not been embraced by the DSLR manufacturers. DNG files are typically larger files and take time to convert. I see no reason to convert CR2 files to DNG when Lightroom 3 and Photoshop CS5/Camera Raw 6 handle the native CR2 format so well. I would much rather spend my free time shooting new photos than needlessly converting files. This was my real issue. The Adobe reader was available for DNG, but Microsoft had not released a CODEC for camera files, until now. I appreciate the information you have provided on your site. It has been very helpful. Wouldn’t be surprised if it goes back to the roots of the war over how “open” the PDF format actually is. That has been a been a riff between the two companies since Microsoft announce that it would add “save to PDF” to the Office Suite. Microsoft probably see the DNG as just another format for Adobe to control. Thanks for the update!